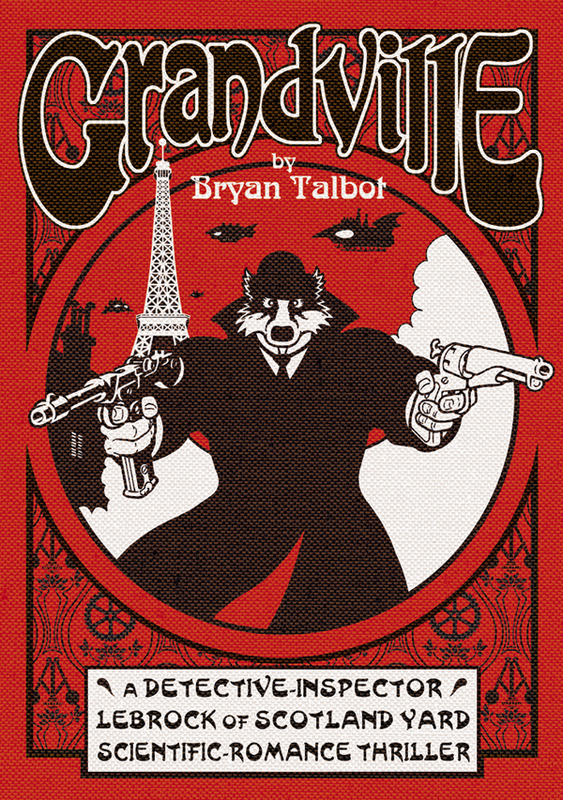 Grandville is an enthralling mixture of not just furry material, but thriller, steampunk and alternative history. This new comic, written and drawn by Bryan Talbot, the man responsible for other famous graphic novels such as Alice in Sunderland and his work on Neil Gaiman's Sandman series, is set in a world full of steam-powered cars, motorbikes, airships, robots (automatons) and other devices; one in which France won the Napoleonic War, and the UK is now The Socialist Republic of Britain, having been given independence from the French Empire due to anarchist terrorist attacks. The story follows Detective-Inspector Archie LeBrock of Scotland Yard, a badger built like a brick outhouse (or should it be set?) and his assistant Detective Roderick Ratzi (a rat), investigating a suspicious murder. This leads them to Paris and eventually uncover a shocking government conspiracy. Talbot makes it clear what his influences are. He states in his introduction that was inspired by the French illustrator Jean Ignace Isidore Gerald, who worked under the name of J.J. Grandville (hence the name), sci-fi illustrator Albert Robida (who is referenced by the fact that there is a Robida Tower that has been bombed before the story begins), as well as Quentin Tarantino, Sir Arthur Conan Doyle, and Rupert the Bear. There are early scenes set in a town that is almost certainly called "Nutwood", although the "D" is hidden behind a pillar. One thing that is made clear in the work is the reference to modern day politics. The is a far-right Prime Minister in the book is called Jean-Marie Lapin, a clear reference to the real life far-right French politician Jean-Marie Le Pen, who almost became President himself. There are also several references to the War on Terror (in this case the terrorists are British anarchists), weapons of mass destruction and 9/11. The book is beautifully drawn (colour throughout) and the plot is enticing, full of twists and turns. It draws you into its world wonderfully and does not want to let you go. Luckily, more books are planned, with a follow-up scheduled for 2010 and another possible three if the first are received well. I for one look forward to them. Grandville is published by Jonathan Cape in the UK, Dark Horse in the USA, Comma 22 in Italy, Jemma Press in Greece, Reservoir Books in Spain and Comics Centrum in the Czech Republic. Copies can be brought from all leading book stores and websites, including FurPlanet. I will have to search for this book on Amazon and make sure I get a good quiet evening I can curl up and read this with a nice cup of coco. Tracker and I met the author in "Travelling Man", where he was signing copies. He assured us that there is Yiffyness inside, which will sell well with most furs.